Lt. Robert Quilter Gilson in uniform [1915?]. Photo reproduced with the permission of Julia Margretts. “To be caught in youth by 1914”, J.R.R. Tolkien wrote later in life, “was no less hideous an experience than to be involved in 1939 and the following years. By 1918, all but one of my close friends were dead.” One of those young men was a thoughtful, promising young artist named Robert Quilter Gilson (1893-1916), who had attended King Edward’s School, Birmingham along with Tolkien. Their small group of close friends called themselves the T.C.B.S. (Tea Club and Barrovian Society, named after the Barrow Stores at King Edward’s, where the group often met), believed that they were collectively destined for artistic and intellectual greatness, and left the school brimming with purpose and promise. 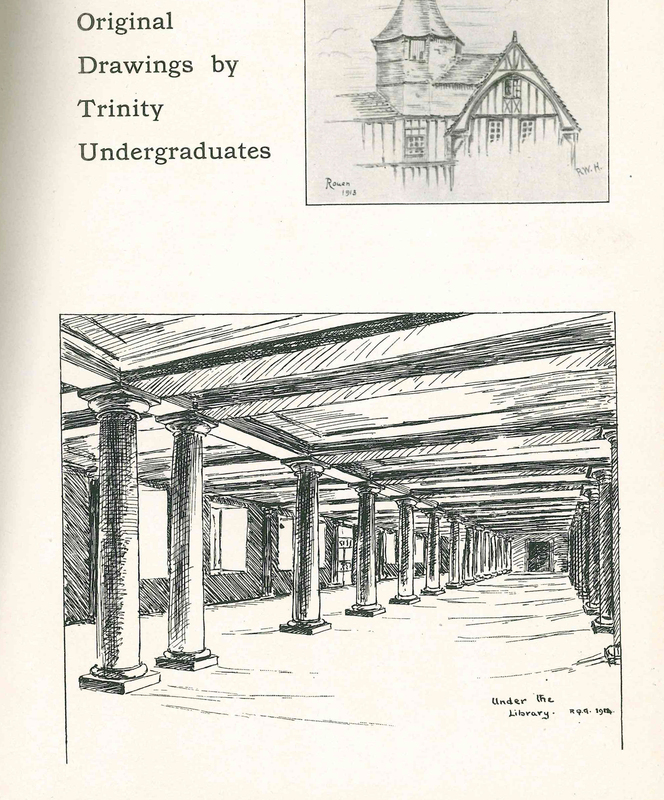 A drawing by Gilson of the cloister beneath the Wren Library, published in Trinity Magazine on 25 February, 1914. Gilson was admitted to Trinity College, Cambridge in 1912, a year behind fellow T.C.B.S.-ite Thomas Kenneth (“Tea Cake”) Barnsley, and read Classics. When the War broke out in 1914, he decided to finish his undergraduate degree and trained as an officer alongside his studies through the Cambridge University O.T.C. 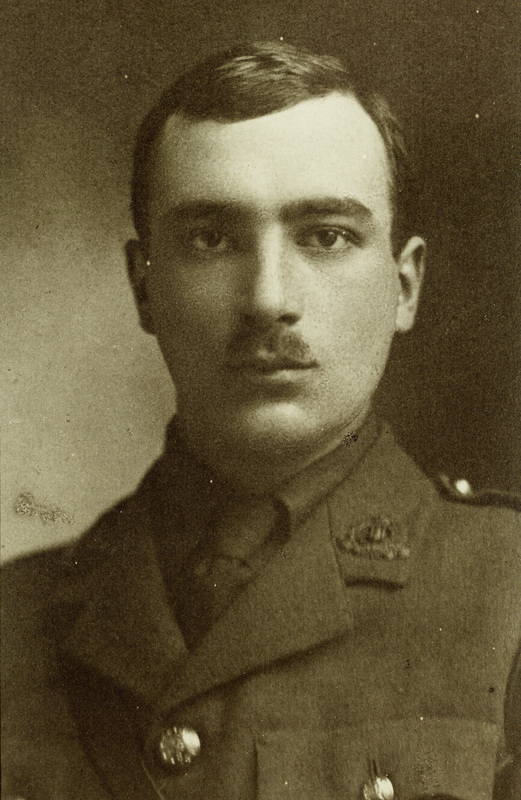 Upon graduating with a First Class degree in the Classics Tripos Part I, Gilson was commissioned as Second Lieutenant in the 11th Battalion Suffolk Regiment, known as the Cambridgeshires. The regiment deployed to France on 8 January, 1916. 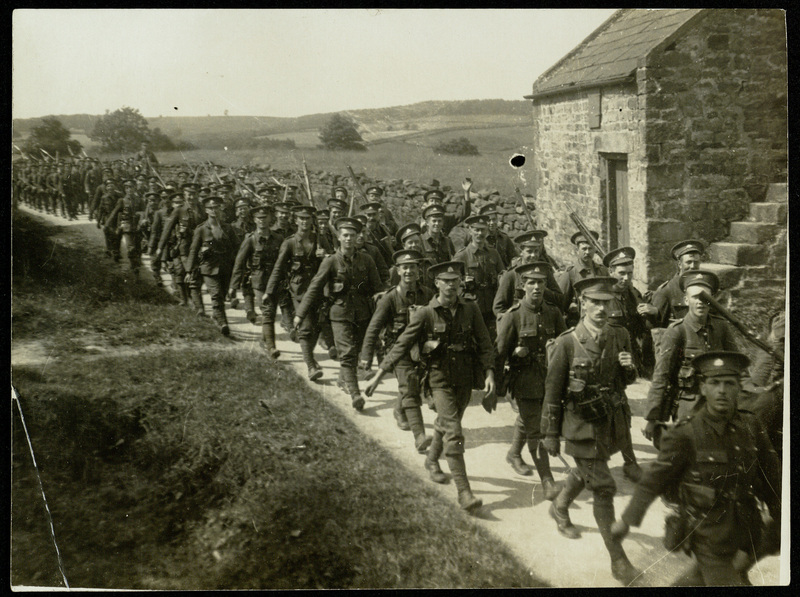 Photo of Gilson (lower right, looking at camera and fully in frame) leading the 6th Platoon of C Company of 11th Battalion, Suffolks on exercises in Ripon, N. Yorkshire in 1915. At 7:30 AM on 1 July, 1916, the first day of the Battle of the Somme, Gilson led his men over the top near La Boisselle. The German guns, which were supposed to have been destroyed by a week of heavy bombardment by British artillery, were still working. When the Cambridgeshires advanced, the German gunners, shaken but still alive and alert, opened fire. A fellow soldier reported that Gilson walked calmly and steadily forward in front of his men, taking charge briefly after his commanding officers fell, until he himself was killed by a shell burst. On that first day of the Somme, Gilson was only one of 6,380 casualties from 34th Division, the division that sustained the heaviest casualties on the deadliest day of fighting in British Military history. 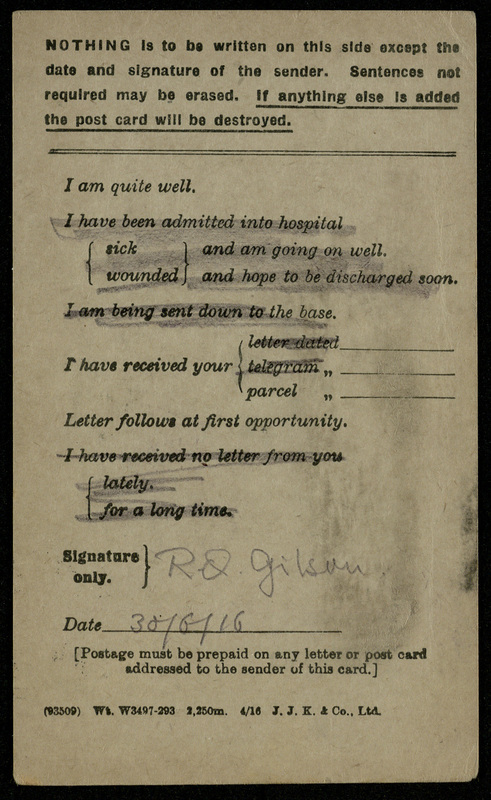 We have a window into Gilson’s brief life thanks to his prolific and eloquent letters to his school friends, family and his sweetheart, Estelle King, written from his time at Trinity College through to his last days on the Western front. 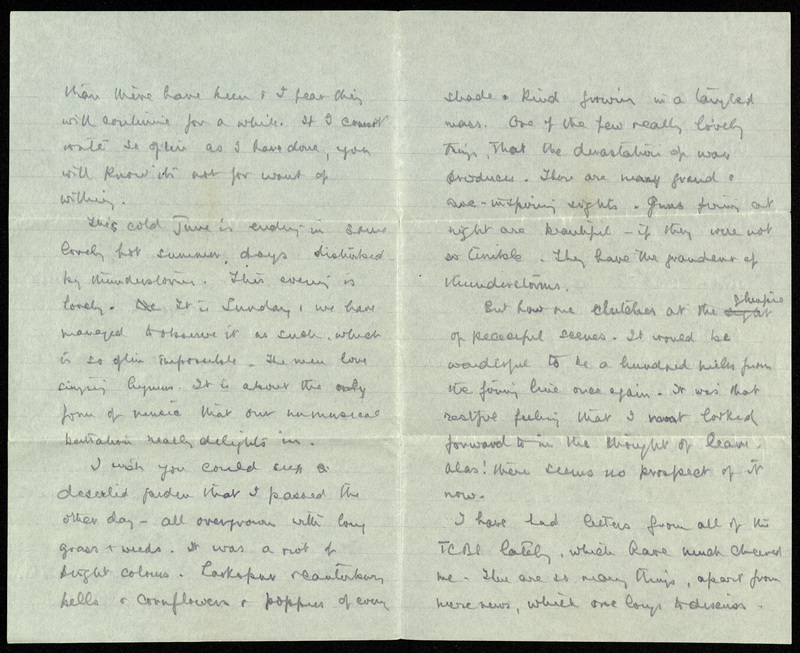 First page of a letter to Gilson’s step mother. October, 1914. 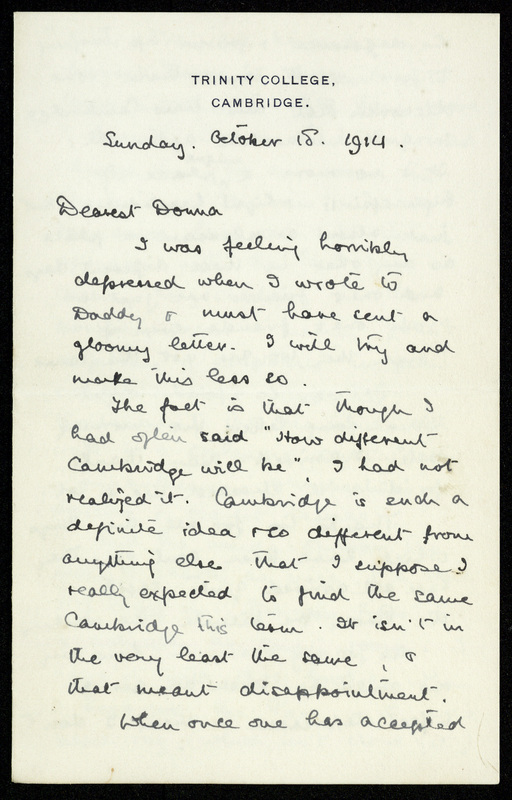 On returning to Cambridge for his final year of studies, Gilson noticed a distinct change in the atmosphere in Cambridge as a result of the War that was declared over the Long Vacation. “It is no more a unique place of high spirits and light-heartedness,” he writes, “but just about as pleasant a place as any other in these different days , and one’s friends are just as much one’s friends, even though they too are not the same.” He describes with satisfaction his new rooms in Great Court, which he got by earning a scholarship for the year, and Trinity in general: “I wish you could have seen it this afternoon with the low sun casting long shadows on the bowling green and making John’s a picture of contrasts in sun and shade and colour. And the border along the beautiful old wall is a splendid sight with chrysanthemums and Michaelmas daisies and scarlet salvias.” His love of Cambridge, and his love of descriptive writing, are evident throughout his letters written during his years at Trinity. Countersigned envelope with sticker showing it was opened by the Censor. 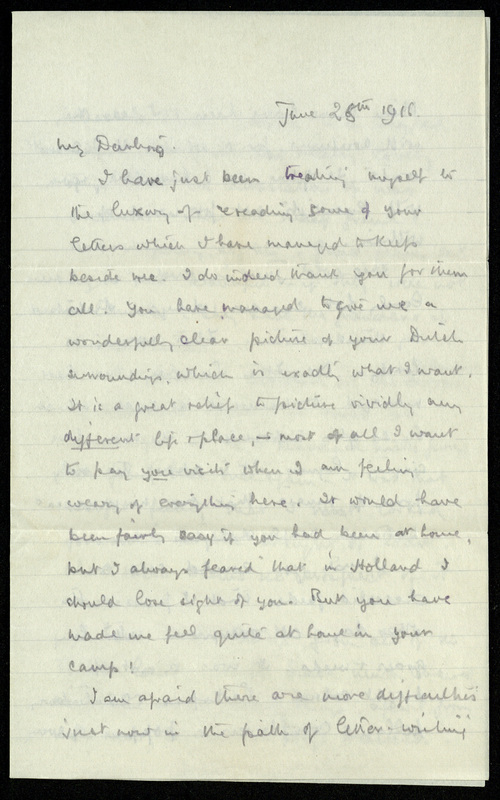 Final page of a letter to Estelle. January, 1916. The letter was countersigned O.H. Brown. 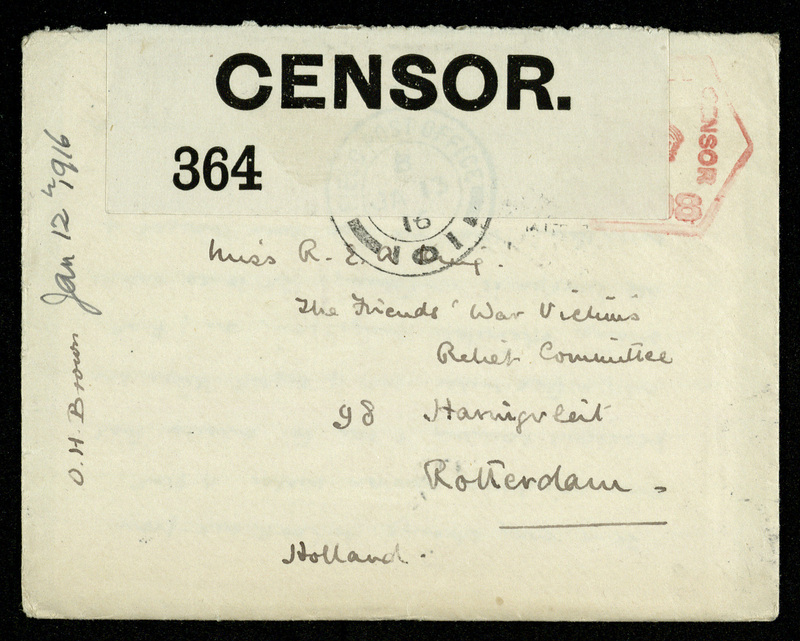 With this letter is its envelope, with a sticker showing that it was opened by the censors. All letters had to pass the censors to ensure that soldiers were not giving away their movements, but Gilson ran afoul of the censors more than once, thanks to his lavish descriptions of people and places. Next to Gilson’s signature is the countersignature of O.H. 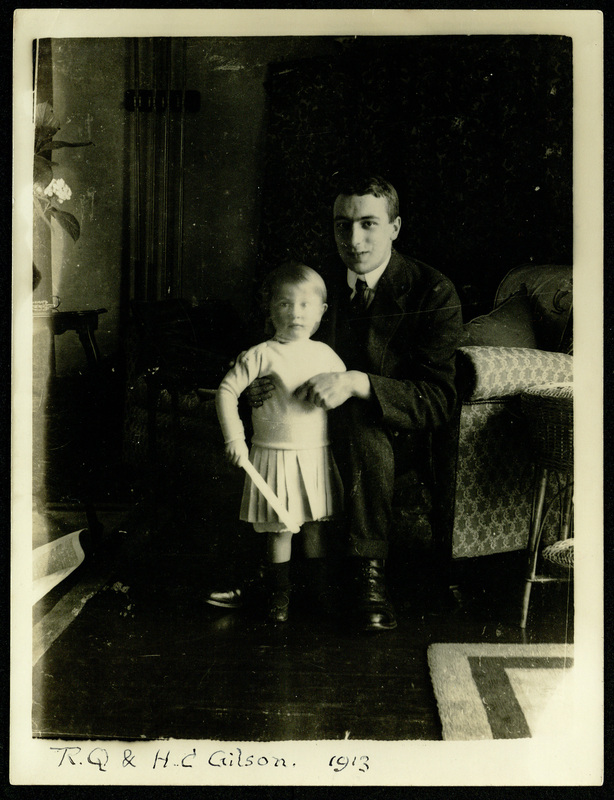 Brown, a necessity that he resented, writing here, “I so much want to hear of your doings in Holland. Your letters will not be censored by anyone we know.” His ability to write is further hampered, he says on the previous page, by the fact that they have been allowed fewer candles on this night, so he is writing “in the midst of conversation”. 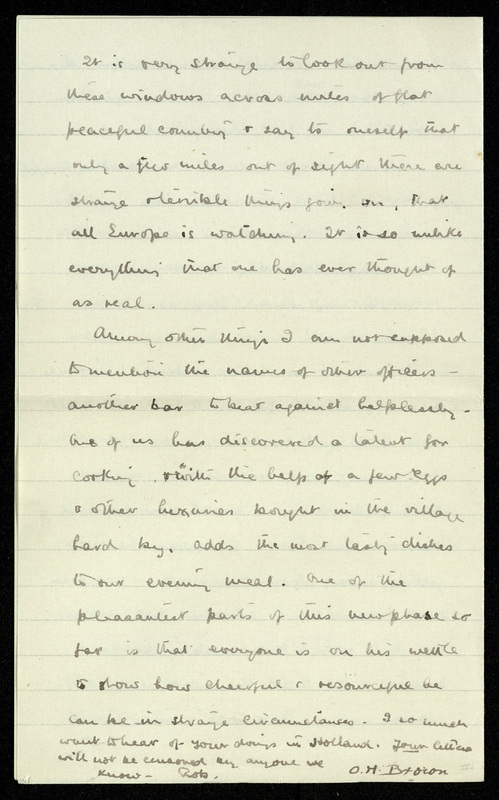 Page two of Gilson’s last letter to Estelle. 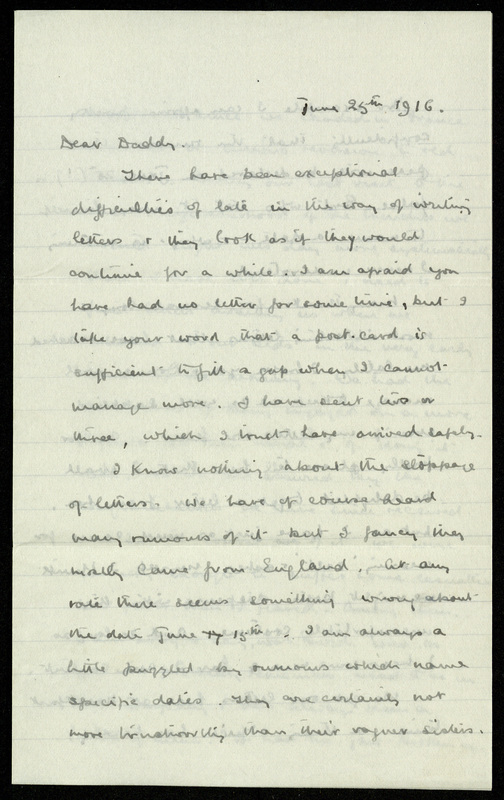 Page 3 of Gilson’s last letter to Estelle. 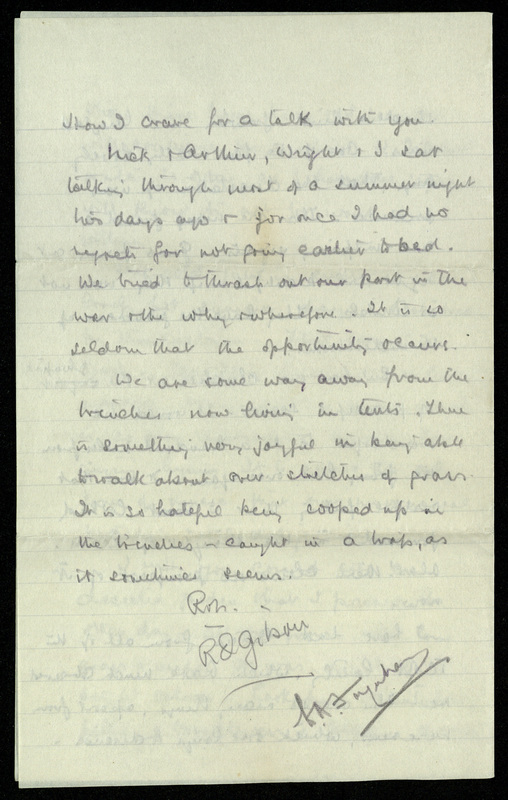 The first page of Gilson’s last long letter to his father, 25 June, 1916. The next day, the Battle of the Somme began. 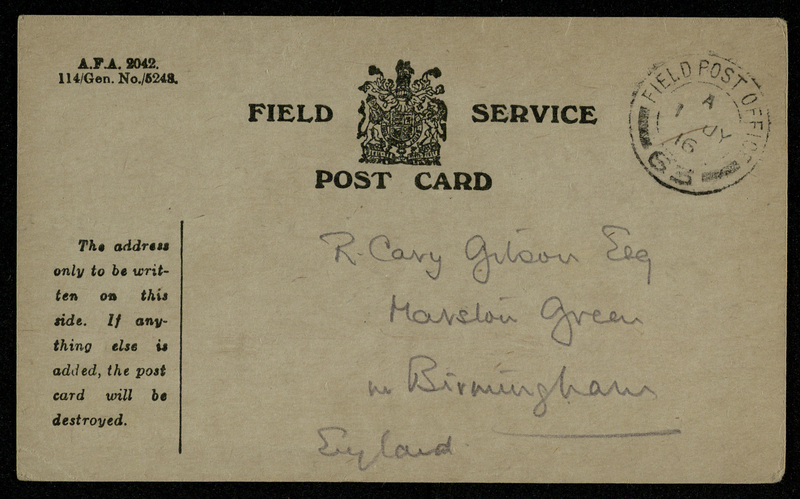 A field postcard filled in by Gilson on 30 June, 1916. The front of the field post card. 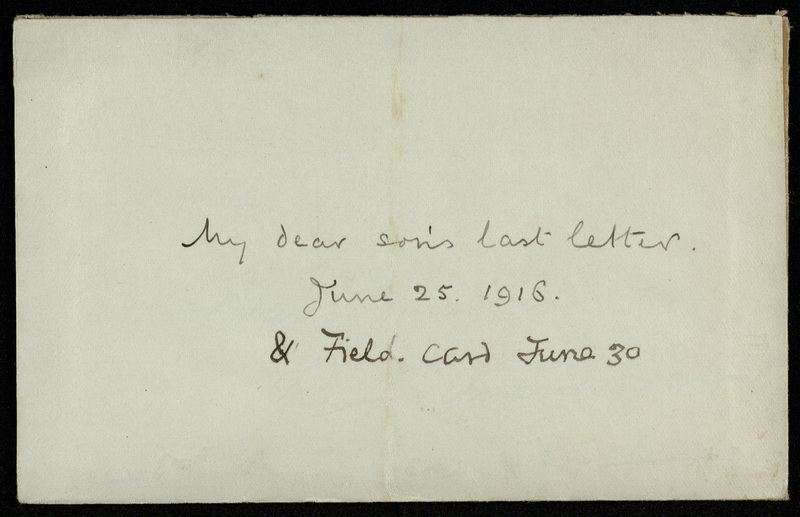 Envelope bearing Gilson’s father’s writing: “My dear son’s last letter”. Many thanks to Julia Margretts and family for the kind loan of photographs and letters and for permission to reproduce them. John Garth (2003) Tolkien and the Great War: The Threshold of Middle Earth. John Garth (2011) “Robert Quilter Gilson, T.C.B.S. : A Brief Life in Letters.” Tolkien Studies, 8(1). Just to give the Trinity Library blogger some feedback. The posts on the First World War are absolutely excellent, and well-illustrated. I am enjoying them immensely. Thank you very much for your feedback! We are pleased to be able to share these stories with those who may not be able to visit the exhibition in person.